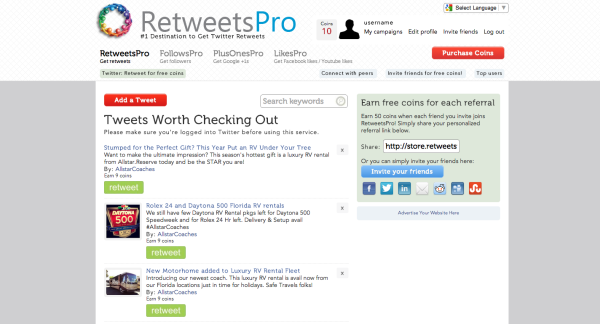 8 Retweet Exchange Websites reviewed (TraffUp, Like4Like…)	I tested a few retweet exchange websites: JustRetweet, ViralContentBuzz, RetweetLine, TraffUp, RetweetsPro, SocialRota, Retweet.it and Like4Like to find out the best one. Retweeting services are a pretty good way to help spread the word out, increase your social media influence and meet other interesting people and businesses. The only drawback is that spammers use these services which degrade the whole idea and can potentially harm your account too. So I created a few test accounts and tested the most popular ones to see which ones are good to use and which ones are either a risk or a waste of time. 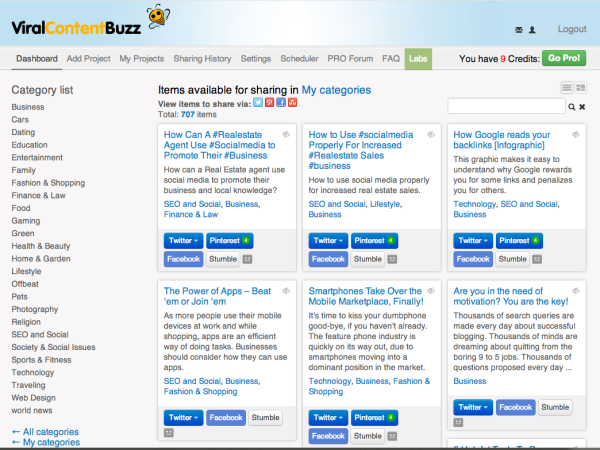 There are tons of websites that offer similar services and from a list of 25+ I picked eight and tried them out: JustRetweet, ViralContentBuzz, RetweetLine, TraffUp, RetweetsPro, SocialRota, Retweet.it and Like4Like. Supports Twitter retweets and followers. 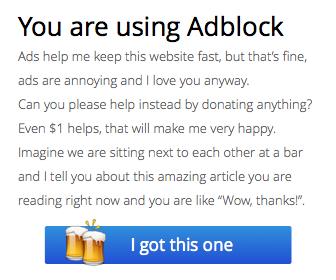 They also have the option to get free visitors to your site although as you can imagine, that traffic is pretty useless. It’s really hard to find something to tweet from a respectable account since most are like: “work from home and earn tons of moneys!”, “make money with turbo peypal”, “super seo specialist for ya website!”… The trick to earn credits fast is to go to the Websites tab and visit those websites to earn tons of credits quickly! 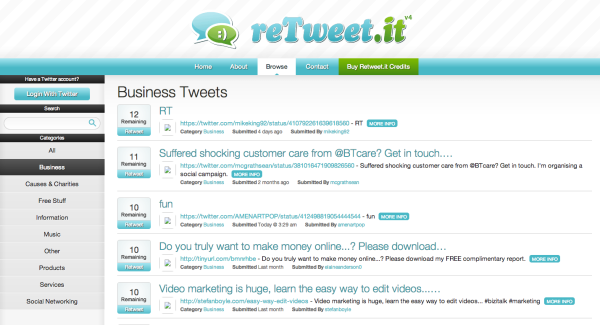 So far it’s the second easiest website to get free retweets and it’s very fast too. I wouldn’t get Followers from there though, most of them are sexual, coupon and free money accounts or users from Asia. Just one tip, do not post more than one retweet at a time since the same account can tweet all your retweets. 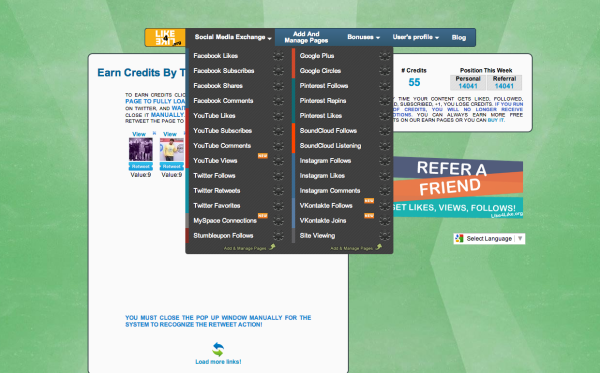 Has the most social networks and options by far (loads of them). Unfortunately, there is no quality control of any kind, a lot of spam content and many users are bots. Also started loosing followers/shares after just a few hours although they reimbursed the credits later. I would use this one just at the very start to break the ice but continue with another service or strategy since there are a lot of spammers. 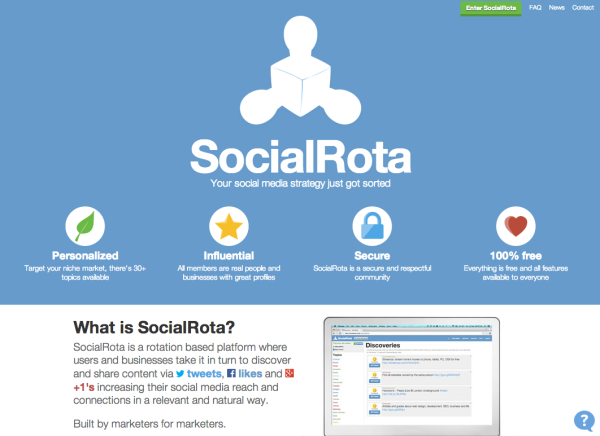 SocialRota has the best design and user experience. The quality of the tool is great and also very easy to use. 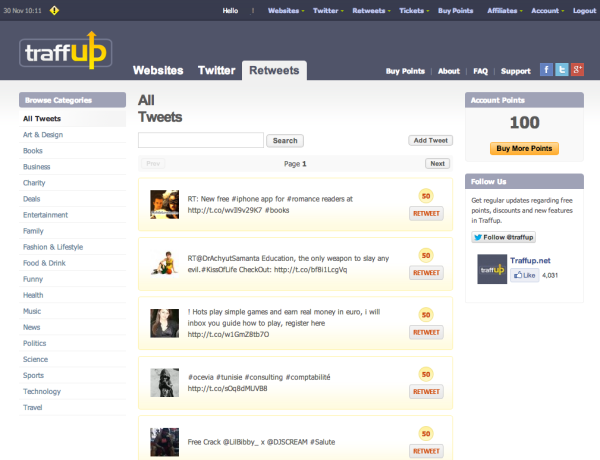 They support Twitter retweets, normal tweets, Facebook likes and Google +1’s. A cool feature about SocialRota is that it lets you customize the tweet to whatever you like so you can post retweets, mentions, simple status updates or anything you can think of (other services force you to tweet that first through your account). You can also use your own URL shortener or keep the URL as is. The only disadvantage is its user base, having launched quite recently, the community is still small and it may take more time than with other competitors to get your stuff out. They combat spam pretty effectively and have measures to avoid unnatural behaviour or abusive accounts. 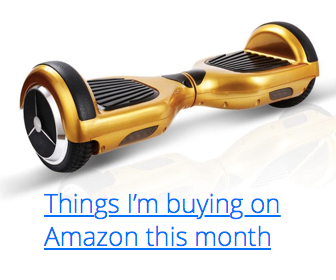 Bonus: The lists are reordered randomly on every page load so nothing gets forgotten in the bottom pages. They modify your link to use their URL shortener. It just works with Twitter retweets. You start with 10 credits although to earn one credit you need to retweet two times (each retweet you do gives you 0.5 credits) which makes it a bit frustrating, spammy and slow for free-only users. Another thing I didn’t like was that your link gets modified to go through their URL shortener system which make your retweets look pretty obvious that they came from a retweeting service. 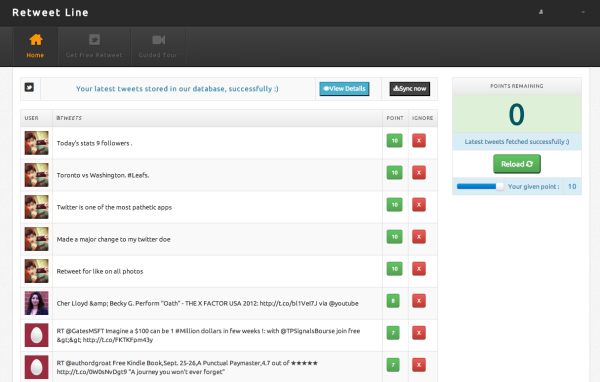 Supports Twitter, Facebook, Pinterest and StumbleUpon (G+ doesn’t give credits). The system starts giving you low respect unless you pay, hence it takes weeks of usage and blind trust to become an effective marketing tool. All new additions are moderated which helps keep the system clean although I signed up on a Saturday and had to wait two days to get my content approved… If that was a timed campaign it would have been a massive fail. On another occasion a European finance article was rejected (?). 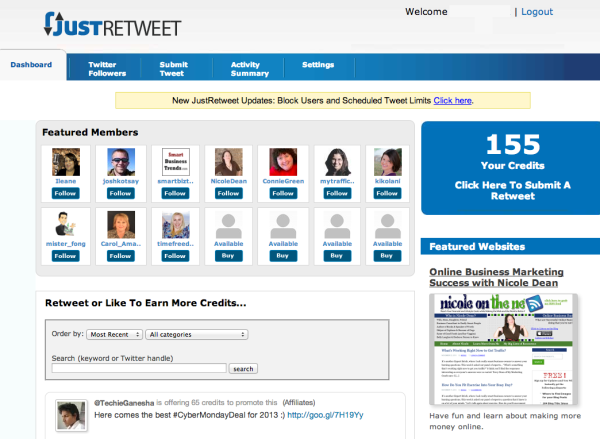 A bit confusing how credits are measured, you start with 10 but you never know how many are needed for a tweet or like. As a newbie I spent all 10 credits on my content and haven’t seen any activity in 7 days yet, it asks for 30 more credits to move it back to page 1… I’m giving up on this one. Supports Twitter tweets (you can customize them but no mentions allowed) & followers, Google +1’s, Facebook likes and YouTube thumbs up. The form submission was confusing and frustrating and ended up posting a tweet without the link. There where only 4 tweets available and none of them where interesting or relevant so it was pretty much useless. Up and running in 20 seconds. It is very simple and easy to use, so simple you can only choose how many points to give, not even what to tweet. It grabs your last 5 tweets and there’s no customization which means once you tweet 5 things from other people you end up getting other people’s retweets instead of yours, pretty pointless. I didn’t find any tweet to retweet in L4L. And traffup is the best of the lot. But can we only link one account on traffup? Is there any way to change accounts in it? You (and Ranjith above) might want to revisit and re-evaluate TraffUp. It has become a nightmare with points being segrated, Twitter follows timers and about half a dozen 50-point website visits at a time now. Like4Like is my go-to for retweets these days. Well here is a thought, we are working on a way to re-tweet our streaming who playing tweets (which we have) the problem is that tweets that are sent to the users/artists notifications do not auto post. I think this what most people are looking for simply for approved promotions. Our Station, MPG Radio is working hard to find a solution that would benefit Artists and Listeners that want to follow streaming play-list rotations. Thank you. Traffup is dead, they don’t hardly have anything as far as tweets anymore, I used them probably 5 years ago and it was much better then, doesn’t seem like are doing as good now. Also a lot of the users that RT your stuff are accounts that don’t have hardly any followers, so even tho your tweet will show a RT or Like, its not really being seen by many people at all. Like 4 Like is the best on this post. I regret joining traffup. I am never going back there. Thank You Bro Help Me To Grow My Social Media Profiles Thank Lot! !